For the most part, Loken’s face looked the same now as it had when we’d dated. Same defined cheekbones, same wide-set gray eyes, same full mouth. He used to smile with that mouth a lot, but not now. I grunted instead of responding. It stung to hear him call me by my formal name, instead of “Ash” or “Asha.”“I didn’t expect things to go this way,” he added, shaking his head. Sunlight glinted off something on the right side of Loken’s face. I looked closer. A thread of metal, a couple millimeters wide, made a swirl design at his temple. The metal tattoo inched down the side of his face and neck and disappeared into his shirt collar.I grabbed his arm to hold him in place, and touched the side of his face. My light-brown skin contrasted with the soft tan of his. His cool skin chilled my fingertips—even cooler than I remembered. What have you done yourself?” I asked. He removed my hand from his face. As he did, light reflected off his forearm. I grabbed his wrist before he could pull it back. Turning the forearm over in my hands, I traced the metal tattoo with my fingertips. It swirled and twisted over his arms after emerging from his shirtsleeves. On the back of his hands, it matched the lines of his most prominent veins. On the front, it followed the creases in his palms. Loken was a Bender, a metal-manipulator, and he felt more whole with metal nearby. He’d told me so a hundred times. I knew he took his practice seriously, but this seemed a bit extreme. He let me examine him at first, just stared at me with gray eyes that were like the sky during a storm. Something fluttered in my chest. Loken yanked his arm back and resumed his walk toward the front of the building, this time at a faster pace. “It was necessary,” he said. 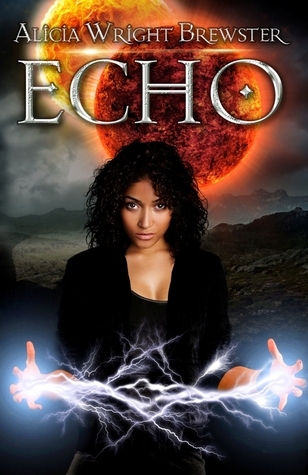 (INTERNATIONAL) Win a e-copy of Echo By Alecia Wright Brewster! Metal tattoos, what the heck? This excerpt definitely has me wondering why he put them on his face and arm. Thanks for sharing! I hadn’t heard too much about this one before. Glad I could share some more interesting books for you to keep an eye out for, Jenni! Thank you for participating in my tour, Melanie! The book’s not part of the “Otherborn” series, by the way. It’s stand-alone, at least for now. Thanks for being on the tour, muffin! Intriguing excerpt I dont think I’ve read about metal benders before! 😉 I like element type stories though the Storm series by Brigid Kemmerer got me interested in them! Because I love the concept behind it! Sounds epic. And I like epic books. So excited about this giveaway and book! Quick question: What bookstore are the gift cards for? I only really know of one that’s wide-spread now since Borders went out of business, and that’s Barnes and Noble. Thanks for hosting this giveaway! Luv ya! Love you too, hon! <3 sadly, I have no idea, but I'm guessing Amazon? Any bookstore the winner wants–as long as Dragonfairy Press can purchase and deliver the gift electronically. Amazon, B&N, Kobo, etc.